Hugs for Hailey: Why do I even have insurance? Since getting back from Christmas in Washington, one of the many tasks is to go through all the mail that we had accumulated. In the pile was a letter from Blue Cross and Blue Shield, Hailey's primary insurance. In the letter they state that they will no longer be covering the Baclofen Medication. Baclofen is a Major part of the medications that Hailey takes. It helps to control the spasms and the stiffness in her body. Pretty much EVERY single child with Leukodystrophy takes Baclofen. She takes it 3 times a day and it's pretty pricey. 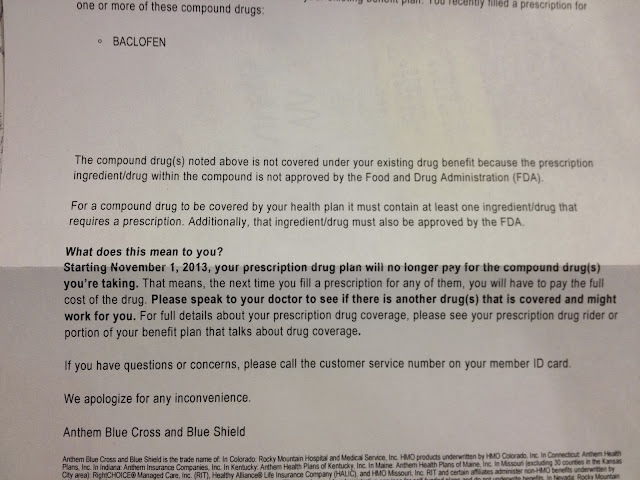 Now they tell me I will have to pay the full cost of the drug when with insurance it was over $100 a month to begin with. Why do I even pay insurance every month when they honestly don't do much for us? It's extremely annoying because this medication isn't something we can just say to heck with it and just stop giving it to Hailey. It doesn't work that way. She needs it and we will give it to her. What really annoys me, besides the whole entire thing, was at the bottom where they say: "We apologize for any inconvenience." Well Anthem, "I don't accept your apology because it's CRAP!"